Two state appellate judges, two Circuit Court judges and a law school professor have been nominated to fill an upcoming vacancy on the Hawaii Supreme Court. The Hawaii Judicial Selection Commission announced today it nominated the five candidates to fill a vacancy on the high court when Associate Justice James Duffy reaches the mandatory retirement age of 70 years of age. Gov. Neil Abercrombie has 30 days to choose Duffy’s successor. The nominees are: Craig Nakamura, Chief Judge of the state Intermediate Court of Appeals; Daniel R. Foley, Associate Justice of the ICA; Circuit Judges Derrick Chan and Richard Pollack; and David M. Forman, faculty member at the Univefsity of Hawaii’s William Richardson School of Law. 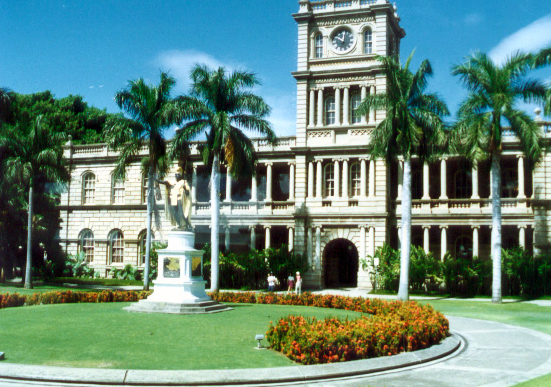 The commission also released a list of nominees sent to Abercrombie for appointment to the Circuit Court on Maui. Those nominees are: Peter T. Cahill, Michelle L. Drewyer, Kelsey T. Kawano, Lloyd A. Poelman and Douglas J. Sameshima. The commission’s news release is here. Seriously Judge Derrick Chan in our opinion misjudged and acted with bias, prejudice, against our case during our evidentiary hearing. During the hearing he would not allow ANY of our crucial prima faci evidence to be admitted during our father’s probate fraud case. Neither the medical forensics showing our dad was 100% incapacitated during the signing of his last will and trust just weeks before he died and only days before he fell into a coma. Also Judge Chan would not allow our evidence by forensics expert Reed Hayes reflecting the signatures on the 1st Amendment signed in California were forged. Even our stepmother admitted she did not co-sign the document. And Judge Chan just sat there listening to us plead our case. For two days we went through this joke of a hearing. And when it came to preparing HIS finding of Facts and Conclusions of Law based on what we submitted and what Jim Ashford and Rhonda Griswold of Cades Shutte submitted, our filing was mysteriously lost for a month. THEN after it was found, Judge Chan signed the papers prepared by Cades Shutte……..essentially granting their motion to have the case dismissed. Judge Chan is in my opinion lazy, incompetent, and biased, and certainly not a man you would want on the Hawaii State Supreme Court. My father was an attorney, I worked for attorneys, and i know how the games are played. If you care to discuss this please call me at (760) 413-5660. Our fight isn’t over. Also visit our web site reflecting what has happened during our treacherous journey with the probate courts in Hawiai including Judge Hirai’s bench. also Robert Grigger Jones, the attorney in California in the Meek case is still under investigation by the FBI with respect to a Pe Ji Ho Ta casino debacle and fraud with the Hurst Financial ponzi scheme wherein they ripped off investors for over $400 million Judge Chan didn’t seem to interested in addressing those charges either.